Martha Hall’s Tattoo. [Orr’s Island, Maine: 2001]. 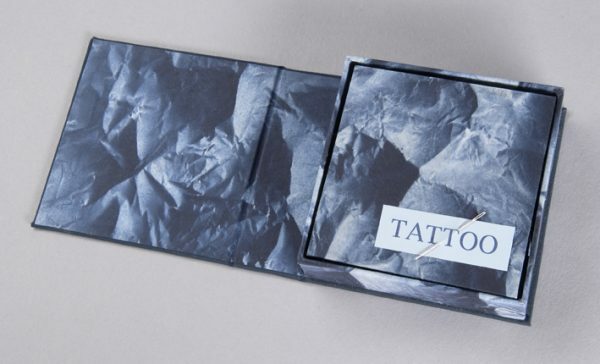 Tattoo interrogates the stereotypes and stigmas of tattoos and cancer. The works was one of Hall’s earliest that received wide attention, and re-established her as a professional artist. It also informed her later works that explore all aspects of living with and dying from cancer. Second edition, limited to 20 copies. 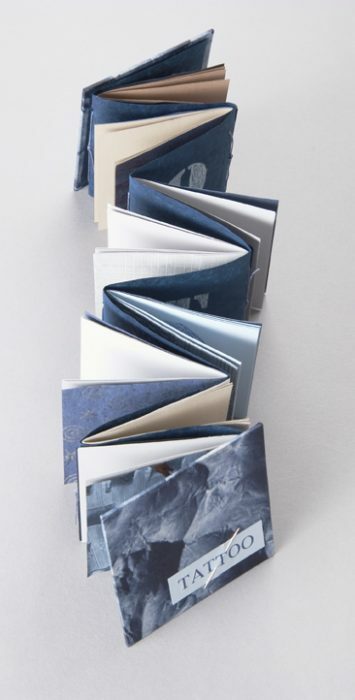 Composed of eight gatherings, bound accordion-fold style, each gathering with its own decorative paper wrapper. Bowdoin’s copy no. 8, dated "3-01." Tattoo was created during a transformative three-week stay at Haystack Mountain School for the Arts on Deer Isle, Maine during Summer 1998. The residency focused on "Dreams and Daydreams" and pushed Hall to introduce more creativity and freedom into her works. It also marked her transition in creative identity from weaver—an activity no longer afforded her by physical limitations—to book artist. That summer, Hall was a full-time executive at L.L.Bean, had purchased a new home on Orr’s Island, and had just been diagnosed with a second reoccurrence of cancer. 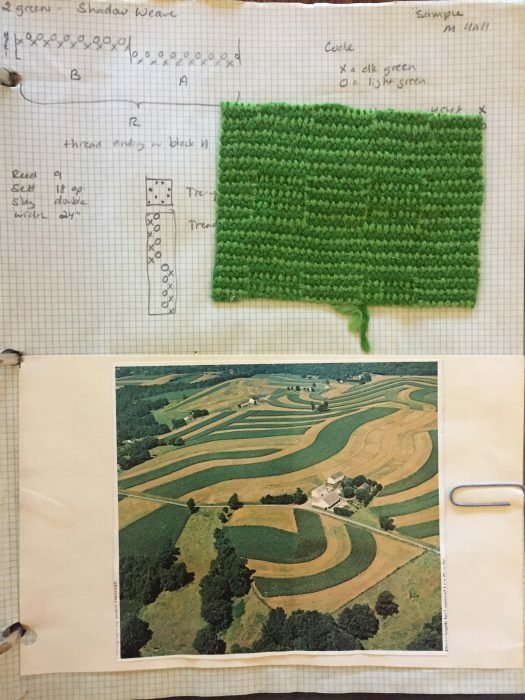 Leaving both responsibility and uncertainty behind, Hall immersed herself in the Haystack experience, learning new binding and paper production techniques, and meeting colleagues who would become life-long friends, including George Barrick, a book artist based in Philadelphia. As an undergraduate at Smith College (Class of 1971), Martha Hall majored in English and excelled at creative writing, honored for her poetry with the same award Sylvia Plath had received. Following graduation Hall taught eighth grade English for several years, but found herself increasingly drawn to the creative arts. Through her husband Alan, a woodworker and builder of looms, she discovered weaving, and became passionately dedicated to it. Initially, Hall wove for her own enjoyment, but after extensive study within and outside of the US, especially in Finland and Sweden, Hall became a professional weaver. 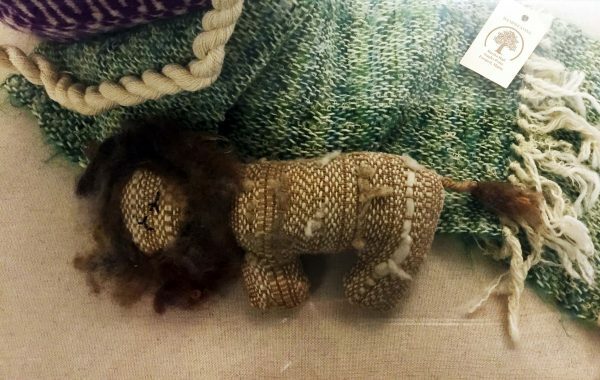 She joined and eventually became president of the Maine Guild of Spinners and Weavers, and was among the guild’s first two journeymen weavers. As a weaver, Hall distinguished herself as a pattern designer. Examples of these patterns were sold from her home, and she also taught students in their production. A student of color theory, Hall developed designs that highlighted natural colors and complementary palettes. 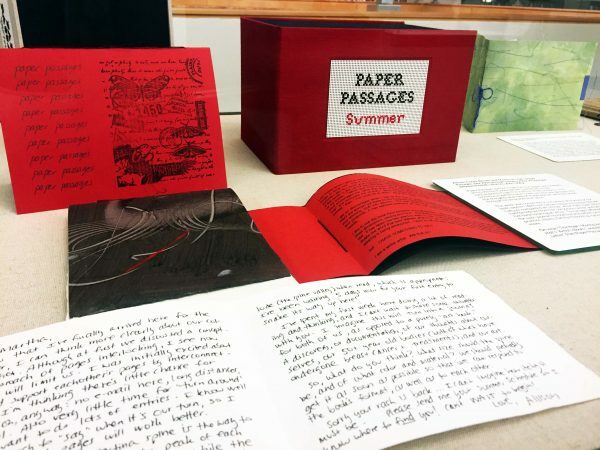 Allison Cooke Brown and Martha A. Hall’s Paper Passages: July 2001 through January 2002: A Duologue between Friends. [Maine]: 2001-2002. Paper Passages gathers together the pages and booklets artists Allison Cooke Brown and Martha Hall exchanged through the mail for three seasons. This intentional gathering provides an intimate glimpse into the thoughts and lives of these women as they cycled through healing and heartache. The work was conceived in a moment of transition for both women. With her cancer long in remission, Brown had just completed art school, while Hall’s own illness had forced her from her corporate career and brought her back to being an artist. The project offered a space for each woman to examine and reflect on her art practice, illness, family, friendship, national events, and more. Martha Hall’s “Weight of the World” from Paper Passages: Fall. In the midst of Hall and Brown’s project, the terrorist attacks of September 11, 2001 took place. Both artists attend to grief and shock, on a national but also personal level. Hall mourns the loss of friends and colleagues in New York and receives news that her cancer has spread, again. Hall created “Weight of the World” on September 29, 2001. 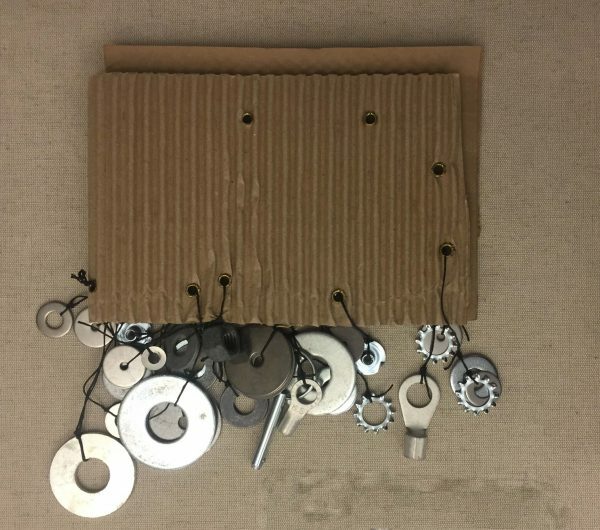 Affixed to the corrugated cardboard cover are weights of all shapes and sizes. The text reads: I feel the weight of the world. or is it the extra weight from chemo on my belly and face or my daughter’s dilemmas that weight me down? It is the weight of the world that makes me so sad. In the late 1970s, Martha Hall sought to balance her growing business ambitions, creative energy, and devotion to her two young daughters. 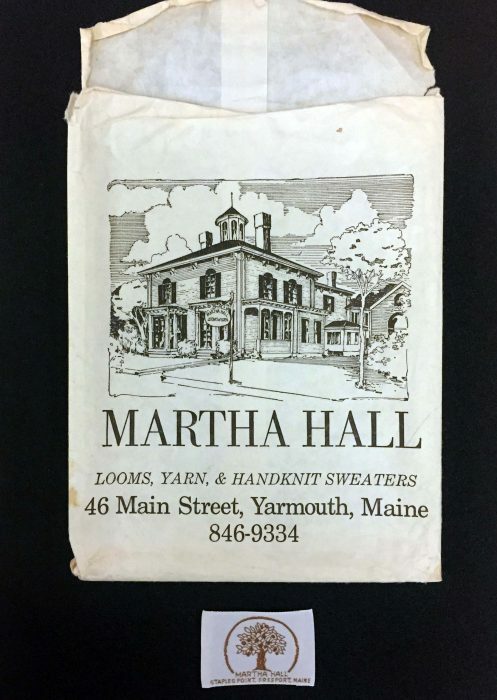 The answer was Martha Hall Looms and Yarns, a business which Hall ran out of the front quarters of her new home at 46 (now 317) Main Street in Yarmouth. The store was eponymously named to encourage customers to feel they were visiting not just a store but a person. Through the logos, letterheads, mailers, mail-order catalogs, and knitting and weaving patterns Hall designed, she built the company into a nationally recognizable brand.